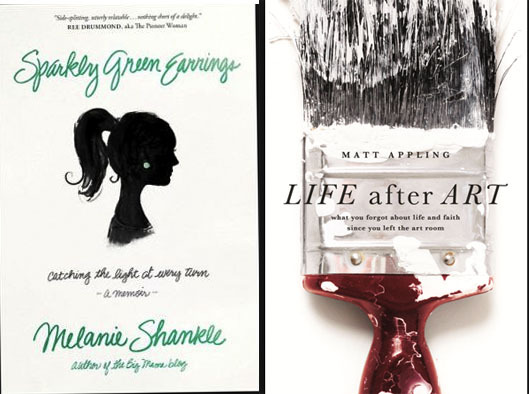 Sparkly Green Earrings: Catching the Light at Every Turn : I am a casual reader of Melanie’s Big Mama blog and was looking forward to diving into her memoir about motherhood. I found the book to be very easy to read and love Melanie’s conversational tone. I think we would really get along in real life. This is a perfect summer/beach read, in my opinion. Life After Art: What You Forgot About Life and Faith Since You Left the Art Room – I really enjoyed Matt Appling’s new book, which is about how art (of any kind) impacts our lives and faith. However, most people leave art behind when they are children. Appling is an elementary art teacher and I found his discussion of children fascinating, as well as his thoughts about how art influences our personality and our life. As a creative, I really enjoyed this book and highly recommend it. I am looking forward to diving into Bread & Wine: A Love Letter to Life Around the Table with Recipes next. It releases next week and Amazon has it for about $10 – for a hard cover. Go check it out. How has your reading been going? I just devoured The Language of Flowers. It’s a story of a girl who lived most of her life in group homes. But finally has the chance to make something of her life. It’s a fantastic read – you will not be disappointed. Shortly before that, I read The Forgotten Garden – also can’t say enough great things about it. I’m still working through Desperate – Hope for the Mom who Needs to Breathe. Thanks for sharing your selections. I am more of a YA reader, probably cause I’m in the awkward not a teen but not an adult stage. Also, if a book is too long I get bored. But I am reading more too. Even though I’m a mystery lover I bought a couple of the books from your list last month and am now reading Remarkable Creatures and am so enjoying it. Next I plan on reading Water for Elephants. Glad for the suggestions from you and your readers. When I ordered my books from Amazon I didn’t click from your page. If clicking from your page helps you in some way, just let me know and I’ll order the next book I’m wanting to read from your list. Thank you. i loved big mamas book.